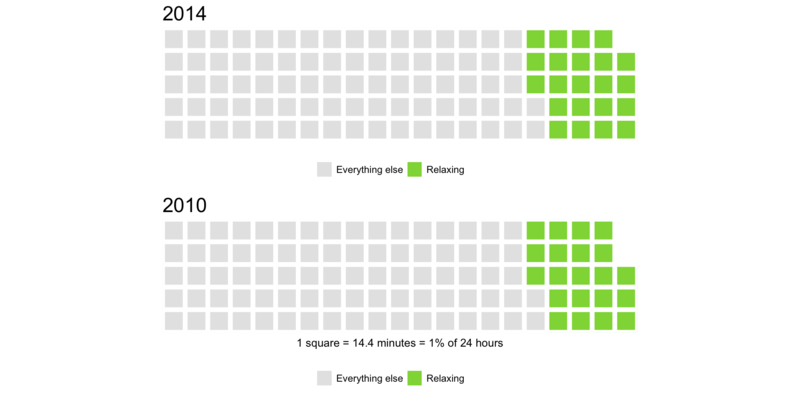 Creating good charts is difficult. Another parts-to-whole chart is a stacked-bar graph. Pie charts and stacked bar graphs share similar challenges: hard to distinguish parts. This happens when you have tiny or too many proportions. And just when you think you’re helping the problem by adding colors to distinguish the parts, the problems become even worse. So what to do when you must show the parts? I recently saw Cole Nussbaumer Knaflic’s challenge on her blog to create a waffle chart or square area graph. (If you have not read her book Storytelling with data, buy a copy now. I had been thinking about writing a post about this topic, so this was timely. Let’s look at creating waffle charts using the two graphics I saw in the Wall Street Journal and in the Economist. We can improve both of these charts. 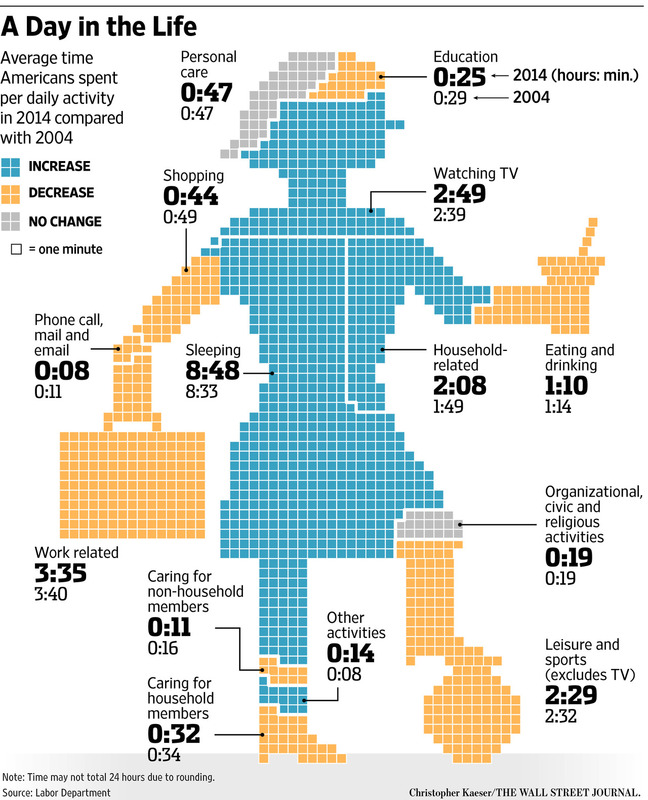 The Wall Street Journal published this story on how an average American spends his or her day. They used a big, really big, waffle chart to show these activities in the form a working women, who plays soccer and drinks martinis. This infographics falls prey to focusing on the cuteness of the graphic rather than just giving the numbers a.k.a. “interesting”. Can we create some charts that give the same information with less ink, thus improving the data to ink ratio? First, I tried creating a waffle chart, using the waffle library in R and following these steps. BTW, rather than showing the total number of minutes for each activity, I thought showing the percentage of the day that an activity takes would be useful. The legend box is bigger than the plot and you can’t differentiate any categories. At least the original graph succeeded in that aspect. We could try to highlight only one category or two categories combined. For example, it “seems” like we spend a lot of time on leisure and watching TV. How does that look when we plot that data? You could use this approach to either identify the biggest time consuming categories or the least. For example, how much time do we spend on education? This approach could work, but we can’t see all categories at once and it’s hard to spot the difference between years. Which chart could work? That’s right. A horizontal, sorted bar chart! What do you think? Would you still go for the balancing lady infographic, or would you use a sorted bar chart? As we saw earlier, pie charts have tremendous recognition in the business world, and at the same time, they are often ineffective as a data visualization. I’ve had my preachy moments of “don’t use the pie chart, ever!” But there are instances in which pie chart is a better choice over other charts. Yes, I said it. At first, it seems like a nicely designed chart. 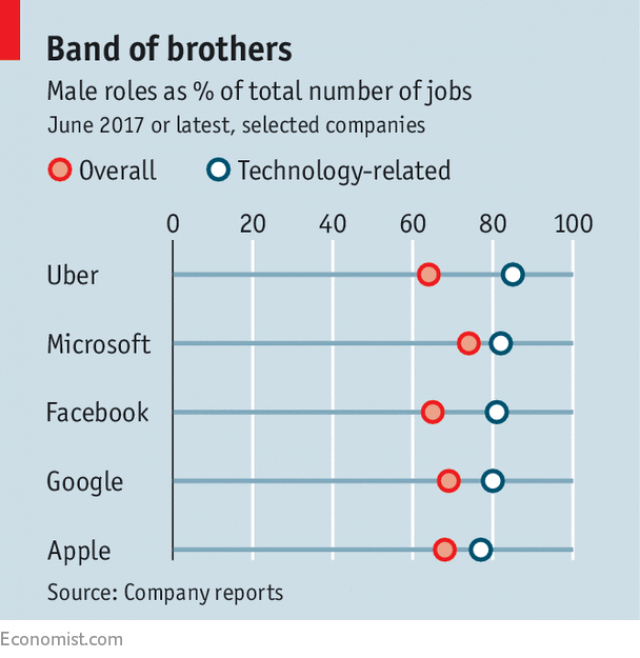 But when you look at it carefully, you observe that this dot chart hides the small proportion of female employees, especially in technological roles, at these companies. A pie chart, yes, a pie chart would show the proportions more clearly and draw the reader’s attention to the smaller number–though we won’t show the exact number, because that’s irrelevant as long as we can make our readers reflect on the matter at hand, the gender diversity problem. Can you see the small percentage of female tech employees compared to all positions at Uber? Would you observe the same thing from the Economist’s dot chart? I’m pretty happy with this graphic (though I could use more pleasing colors), but how would this data look using a waffle chart? Which one do you think are more effective: pie charts or waffle charts? You saw a gigantic waffle chart that can be turned into a dot chart for higher effectiveness. And, you saw an ineffective dot chart turned into pie charts. What does that tell you? That I’m confusing? Maybe. Or, that every chart has its place and you as its designer must think about its objectives to create the right graphic.